Well, the NSW DET has finally gotten up to blocking the last place we had left to blog, edublogs. Along with everything else. Any site that can be classified as a blog or wiki is blocked to students from years 6-10 at best – most are blocked for senior students too. The constant fear that we all now must live with of our students having any interaction *whatsoever* with the outside world lives on. 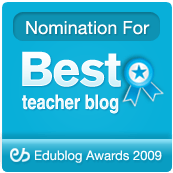 Forget using edublogs, pbwiki, twitter, edmodo, wordpress…the list goes on. Add to this the continued blocking of two of the most used/useful sites on the whole internet – Google apps and YouTube – and what is there left on the internet to use?? All users must be registered and password protected to prevent anonymous contributions. All contributions are moderated by the Teacher Administrator before publication. I can see where they are coming from. Honestly. But guidelines like this make it either untenable or just plain uncomfortable to use a blog with a class. Students who have problems signing up, logging on, or remembering a password will be disengaged with the blog and class management becomes a joke in blogging lessons where kids can’t get onto their blog. And moderating comments before they are published is just too much. This is like asking kids to run their classroom answers past you before they say them out loud! Using online learning spaces provide students with opportunities to learn about cyberbullying and ‘netiquette’ – shielding students from online environments will not adequately prepare them for the world of work into which they will enter post-school. School rules, student welfare, and sound pedagogical practices are not abandoned in these online spaces – if anything, the transparency of these sites (your Principal, or your student’s parents, could decide to take a look at any time!) is more likely to promote professional practice.